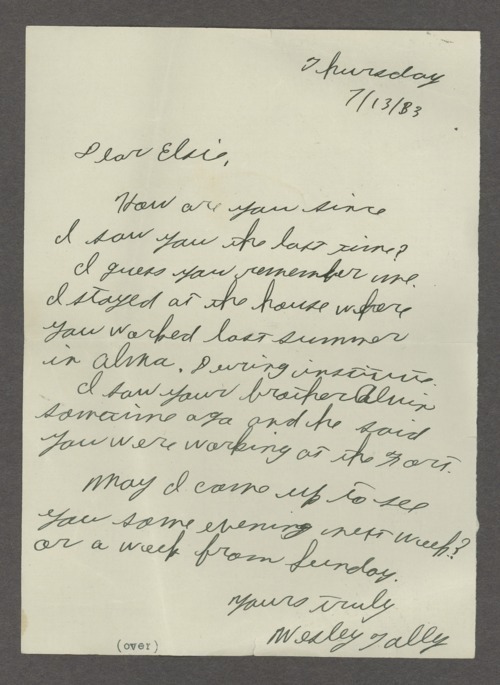 This is a collection of letters written by Wesley Tally and Elsie Hasenbank in the mid-1930s. During this time, Wesley and Elsie were dating and the letters tell about their developing relationship. In 1933 and 1934, Wesley was a teacher in Council Grove, Kansas, and worked part time for the telephone company. Elsie worked as a housekeeper and au pair for several families in Emporia, Kansas. Elsie also spent some time in Fort Riley and Alma. In March 1935, they wrote about the dust storms and how they impacted their lives. That same year Wesley had difficulties finding a job and he joined the Civilian Conservation Corp. He was sent to Camp Burns Lake at Cass Lake, Minnesota, where he served in the 1765 Company working in the forests of northern Minnesota. Wesley describes the work he performed in the camp and his leisure activities. Elsie wrote about her work, the weather, her family and friends, and her leisure activities. After leaving the Civilian Conservation Corps in April 1936, Wesley enrolled in the Davey Tree Expert Co. He left the tree service training before finishing the course and returned to Kansas. The last few letters are about their impending marriage and moving to Kansas City, Kansas, to live. A searchable transcription is available by clicking 'Text Version' below.